Sanderson ViraMAX 1-A-Day 30 helps to boost the body's immunity by supporting acute respiratory tract conditions and maintaining the body's health especially from illness affected by low immunity. Qty FREE International Delivery on all regular sized orders when you spend over $120. 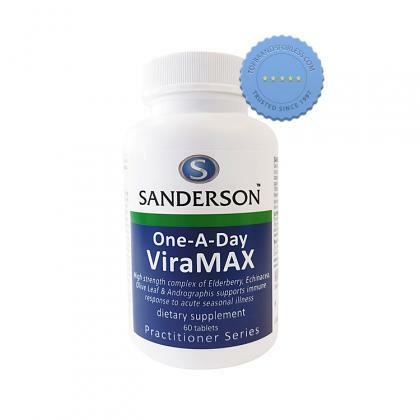 Pump up the body's immune response against acute upper respiratory tract infections with Sanderson ViraMAX 1-A-Day 30. It is formulated with a high strength complex of Elderberry, Olive Leaf, Echinacea Purpurea and Andrographis to strengthen the body's protection. Elderberry 5000mg, Olive Leaf 2500mg, Echinacea Purpurea 2000mg, Andrographis Paniculata 1000mg. For acute stage, take 1-2 tablets per day with food for 5-7 days or as professionally prescribed. For best result start taking at the first sign of symptoms. If taking two tablets, take morning and evening. For maintenance, take 1 tablet per day or as professionally prescribed.